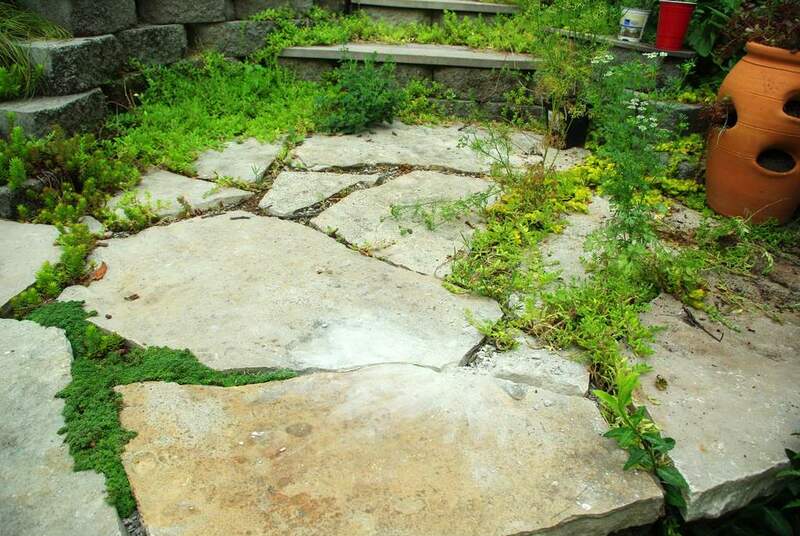 I went looking for more of this to add to the stairway landing (I don't know if that's the right term -- it's a set of stairs, then this small patio, then another set of stairs) but I couldn't find it locally. 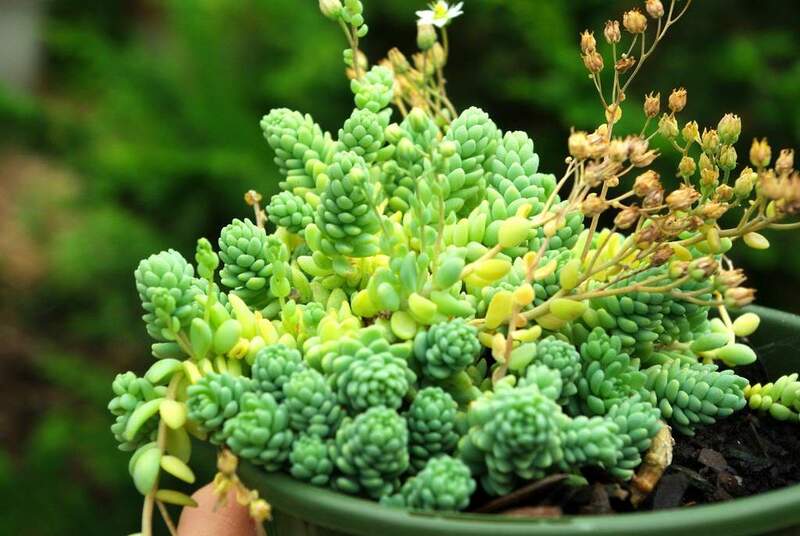 I did find a couple of other similar plants that I'm going to try though. 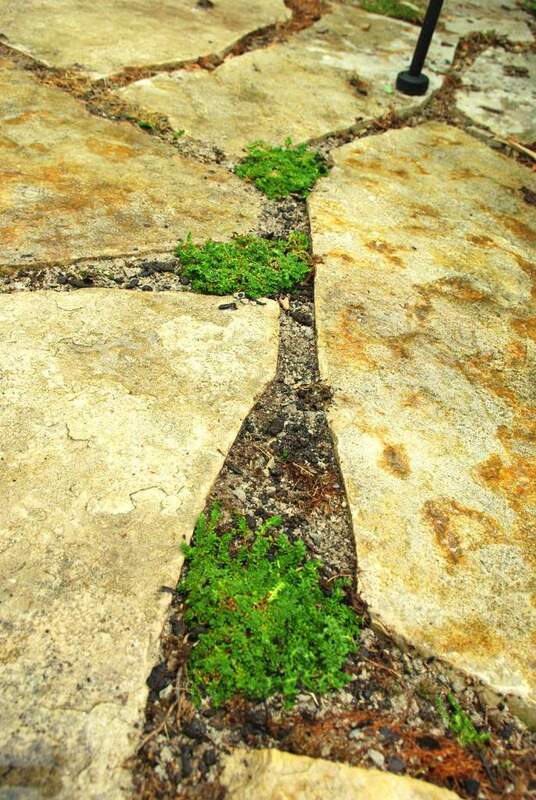 First I need to fix this uneven stone. 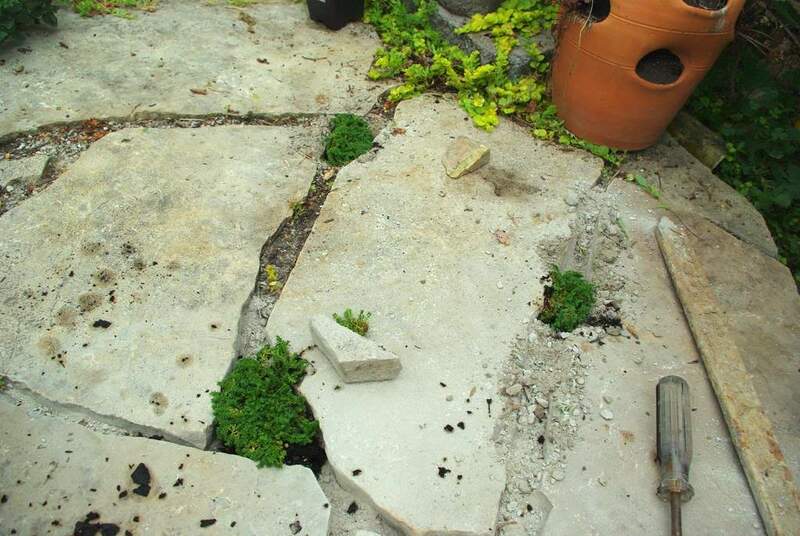 It settled a bit (I think because a mole tunneled underneath it) and is a trip hazard, so I'll pry it up and jam more of the crushed rock underneath it. This material is called "minus screenings" at the local material supply where I get it. 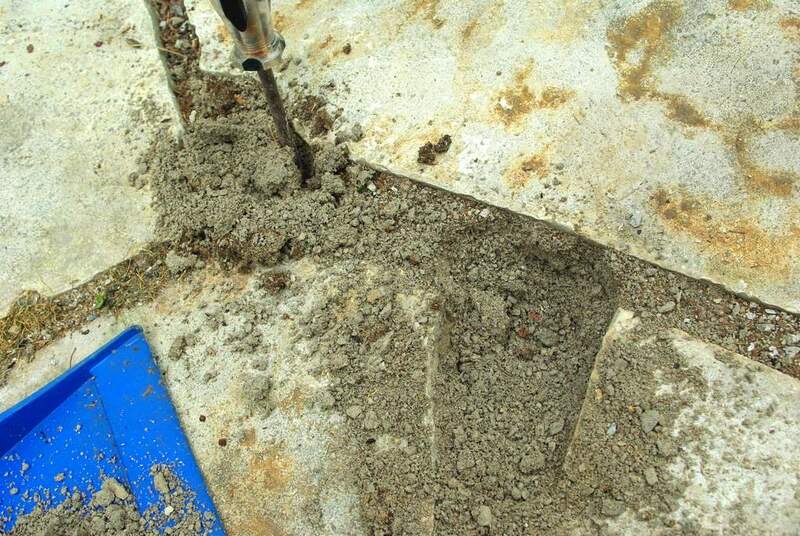 It takes a lot of pounding with an old screwdriver to pack the filler in, but you need to keep packing until you can't fit any more or the stones won't be solid, or may settle again. 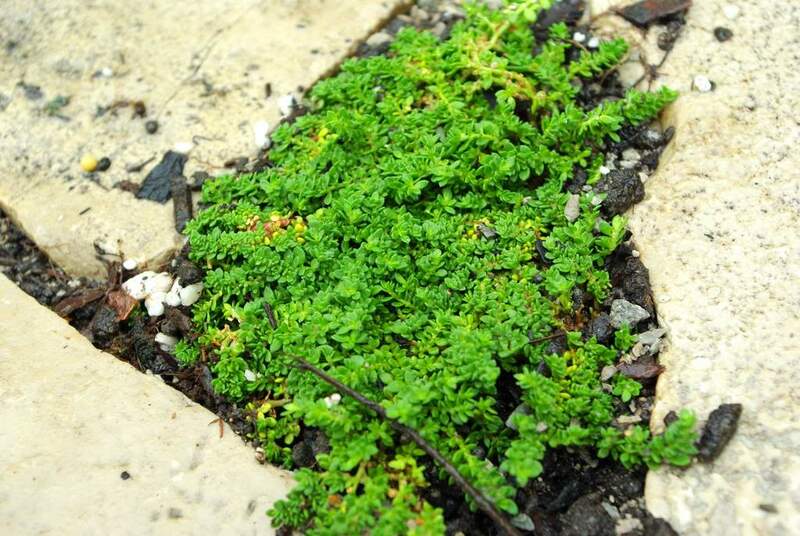 That's a "miniature stonecrop" sedum requieni. 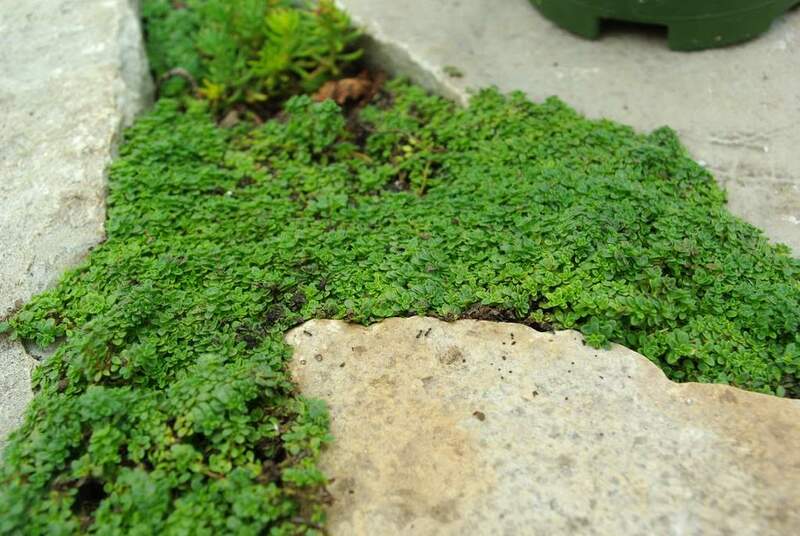 It looks pretty darn close to the 'minus' thyme and should be just as tough if not tougher, so I'm eager to try it out. Plus it was on the 75% off table at the nursery -- gotta love sale plants! 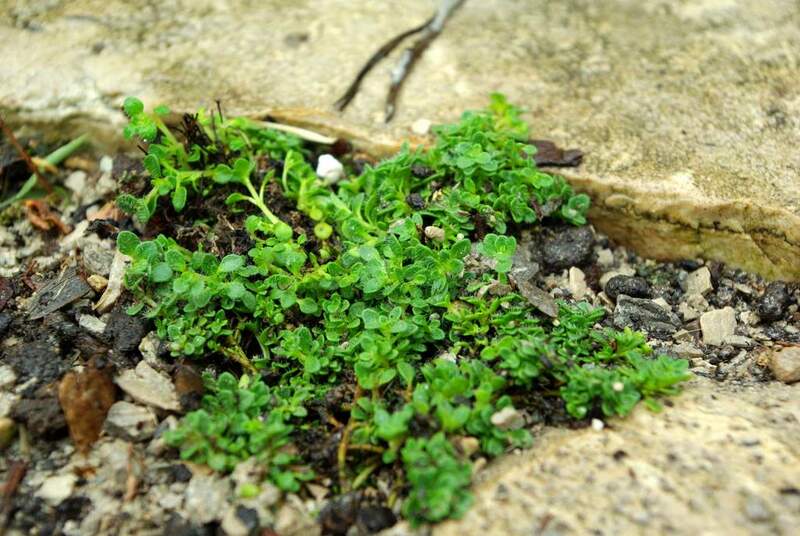 The second one is another thyme called 'Elfin'. 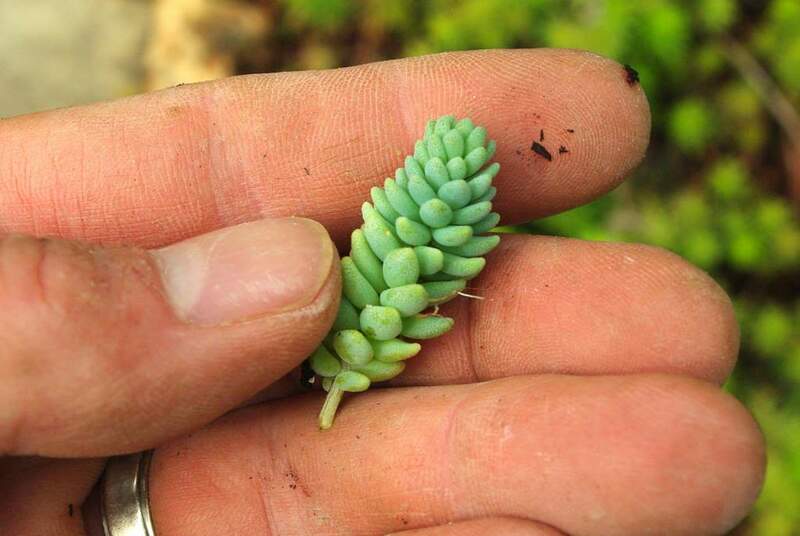 It's not quite as small-leaved as the 'minus', but I'll give it a try. 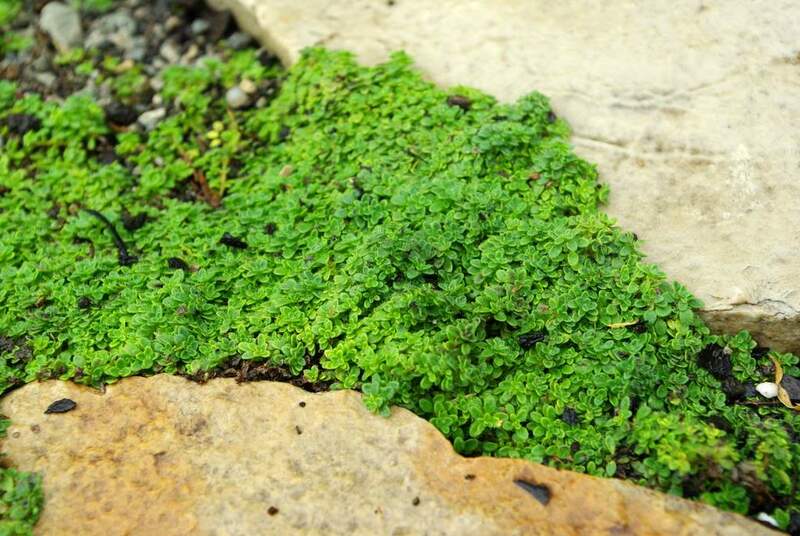 Groundcover plants are really tolerant of this, as they typically root everywhere they touch the soil. 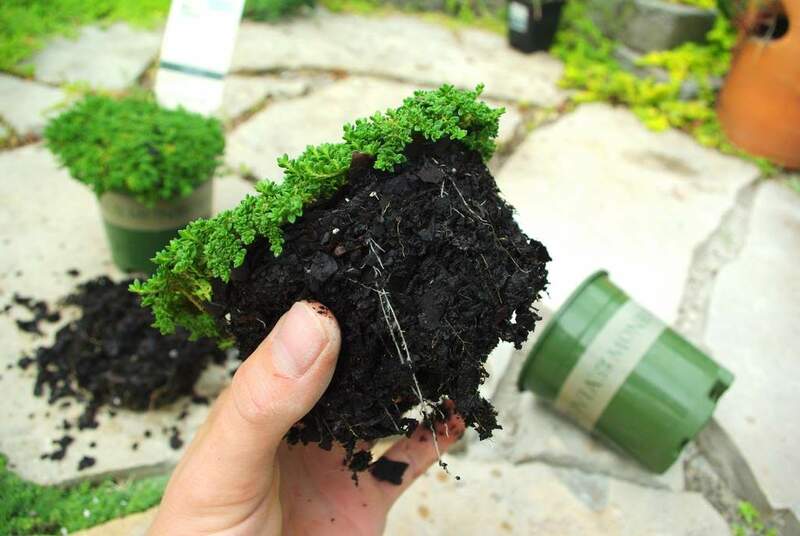 Sedum in particular are super-simple to root this way. 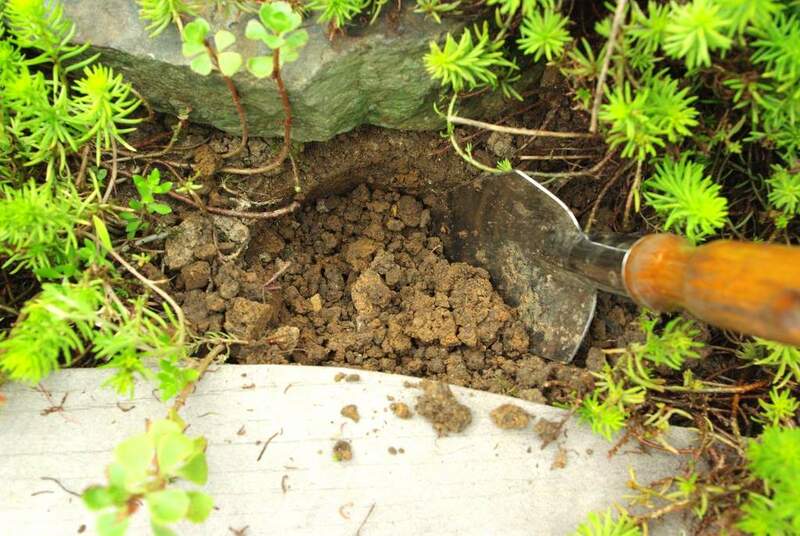 To fill the cracks I use a mixture of topsoil and the screenings, then pack it a few inches around the plants. Further away it's just straight screenings (no topsoil). 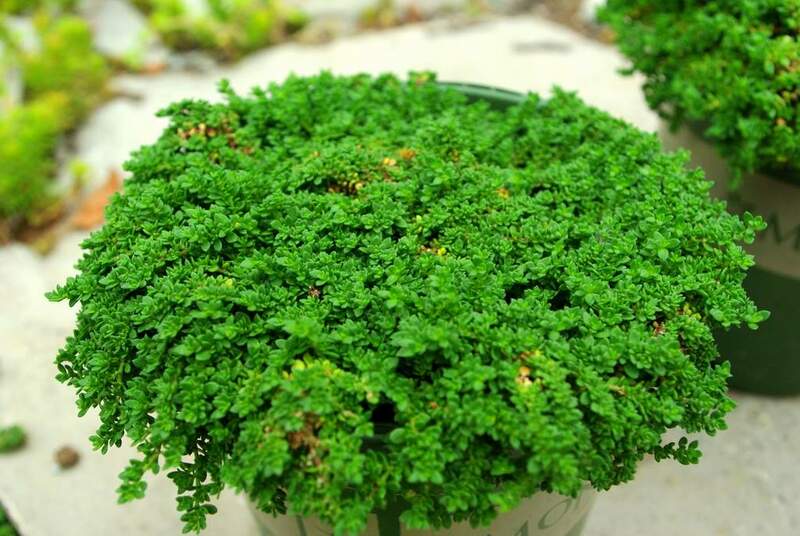 The thyme has been spreading into the pure screenings areas with no problems, but I want the plant to have some topsoil near it to help it get established. 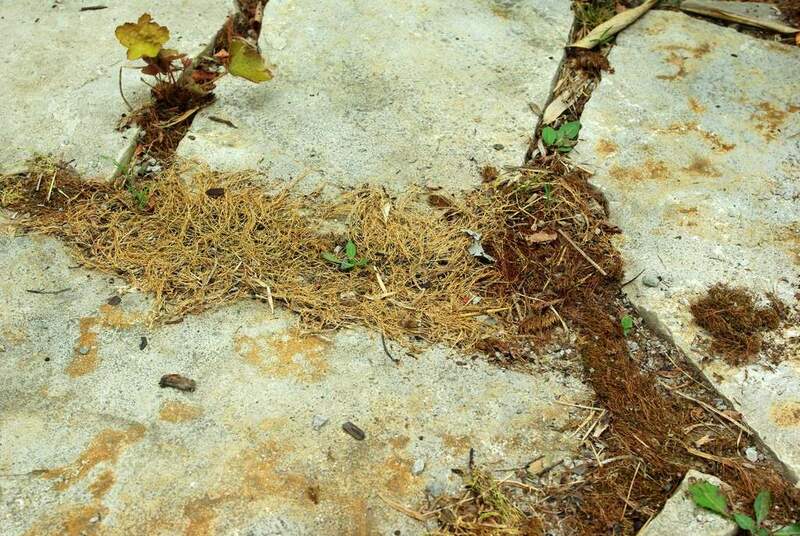 Looks like those plants have been there forever, doesn't it? Hopefully they'll do well here and spread quickly. 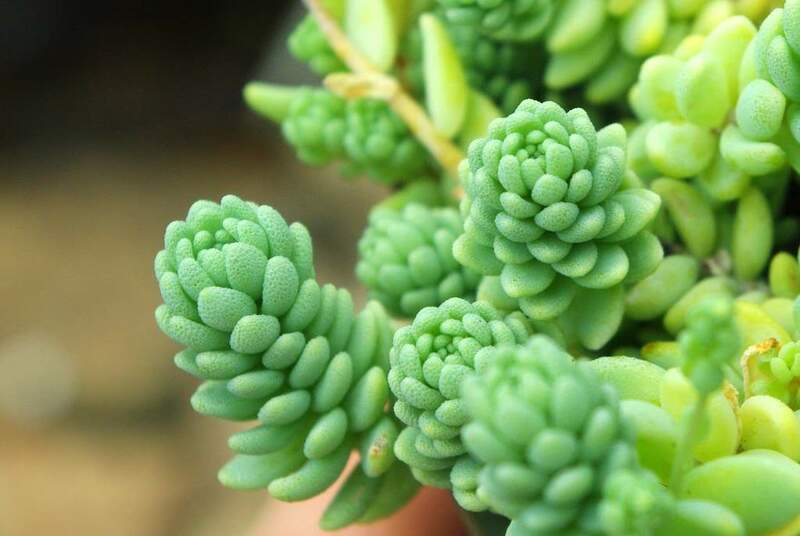 Once I see how they're doing I'll probably take small sections of sedum off and plant them in middle parts of the cracks to help it fill in faster. They're all so similar! I'll have to see what they look like in a month or so. As you can see, they're pretty ugly. 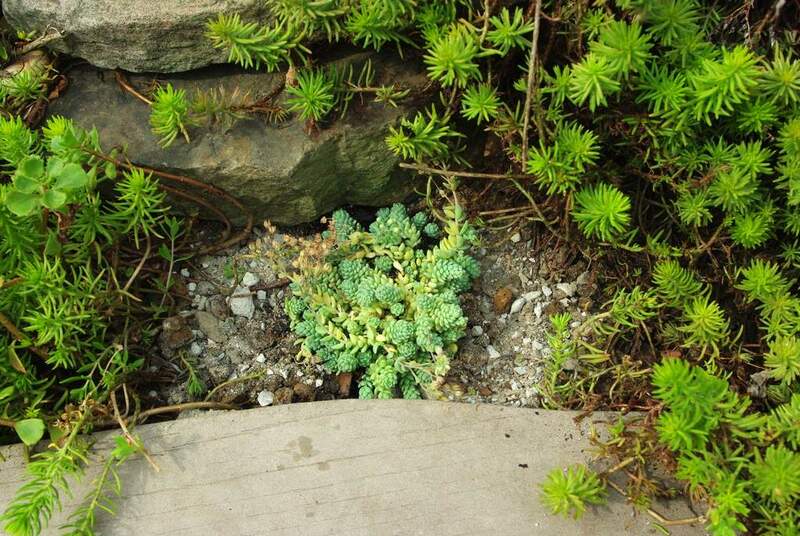 Hopefully the sedum will do better, as it requires much less moisture. My only concern is that later in the summer when the vines cover the pergola, this area may not get enough sunlight for the sedum, but I won't know until I try, right? It's nice to see a little bit of green down there again! 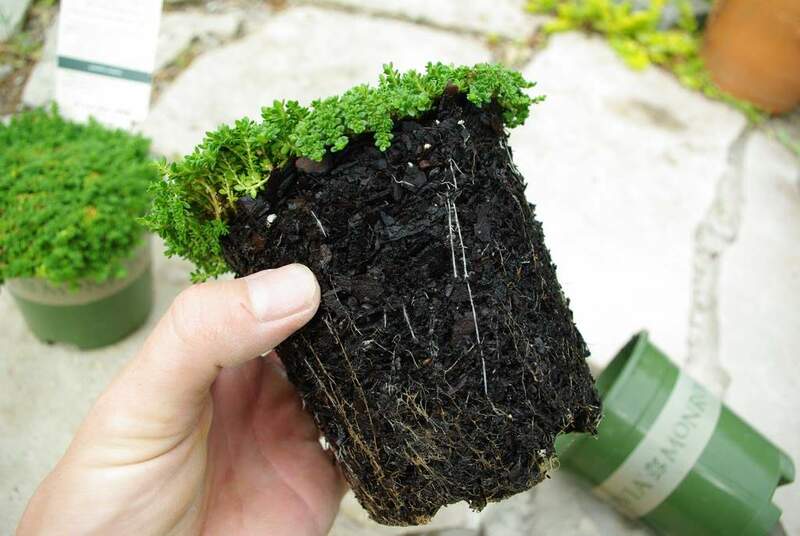 Sedum is usually extremely quick to root, so I'm hoping these will take root and start growing pretty quickly. Looks good! As always it will look better once it fills in a bit more, but I like it! You can see the little roots forming already. I just need to lay this piece on the ground for a week or two and it will be rooted and start producing a whole new plant. What a productive, fun morning! 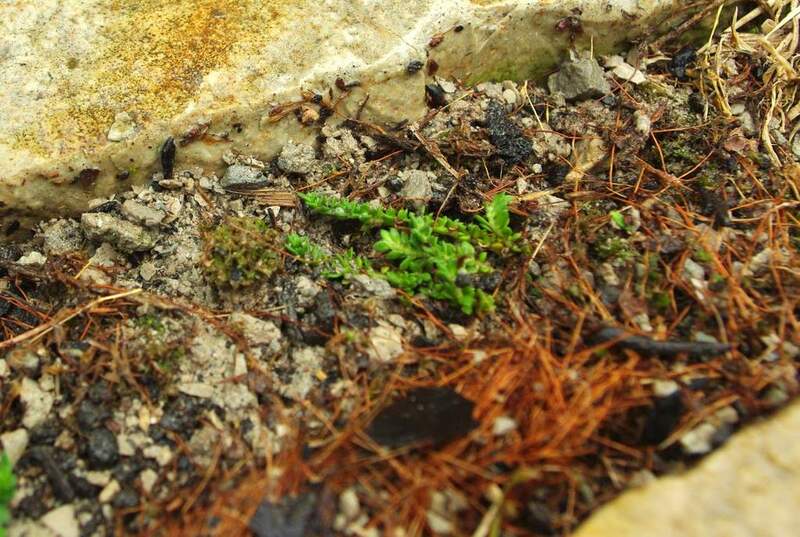 I'll post an update on these plants in a few weeks (or if something unexpected happens to them). 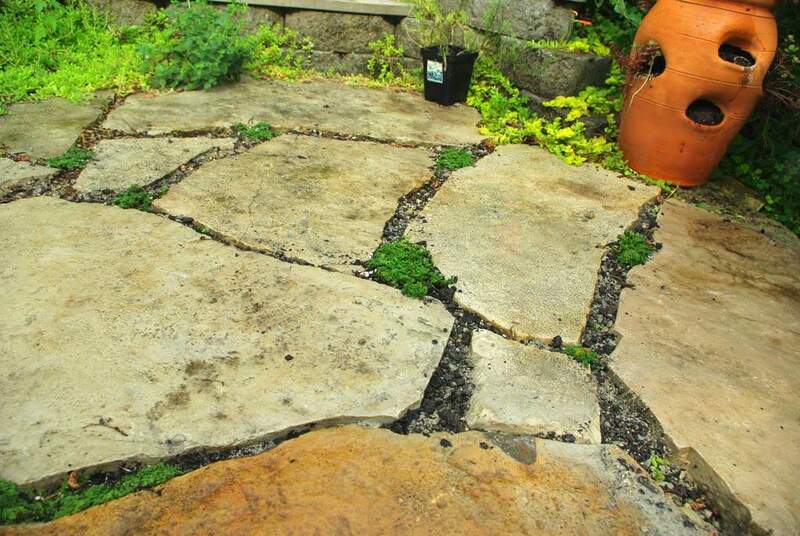 Two words: polymeric sand. 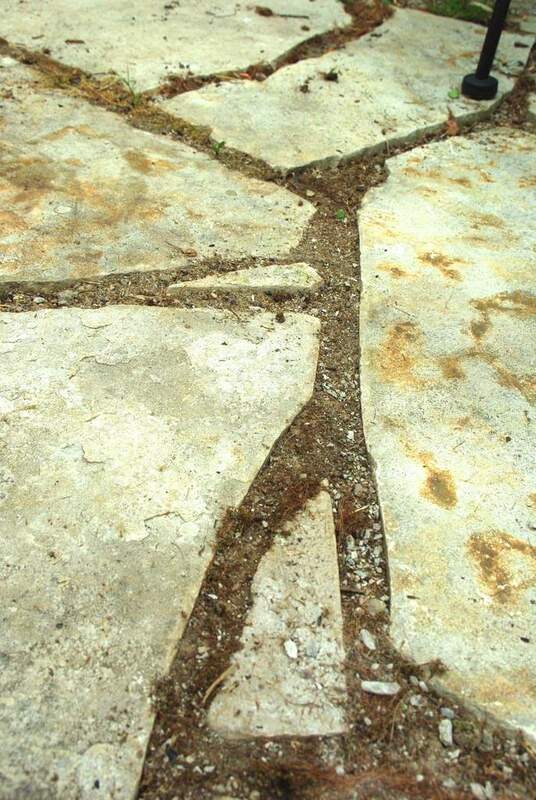 Cement won't work because it will crack. 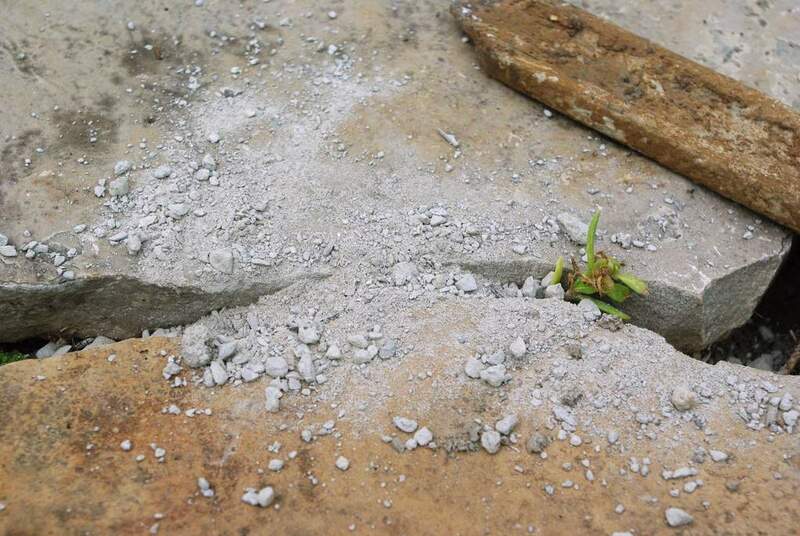 This stuff is designed for filling cracks. ok - we're doing this exact same thing right now. 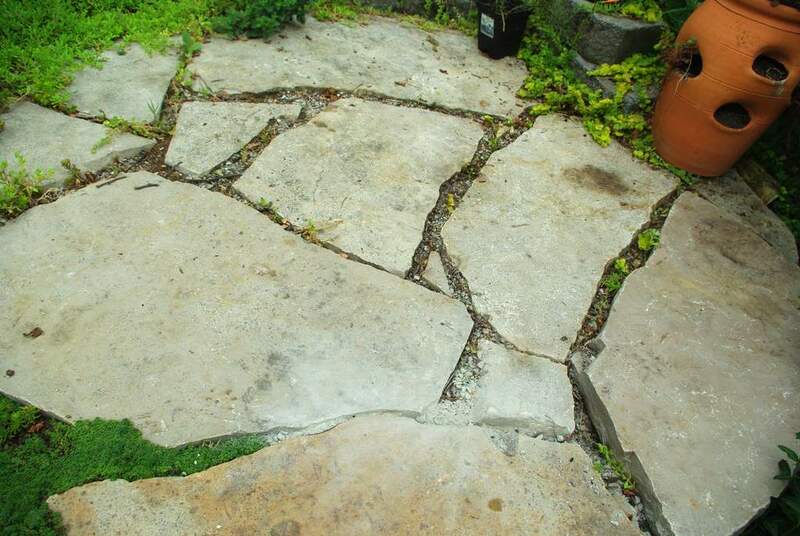 We have similiar flagstone patio and are considering the exact plants you mentioned to fill the 2-3" cracks. 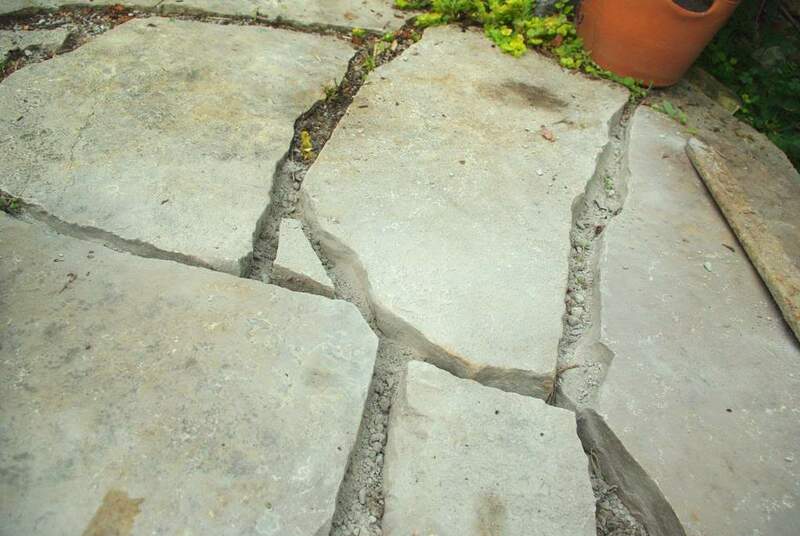 I'm interested to see what your patio looks like now? 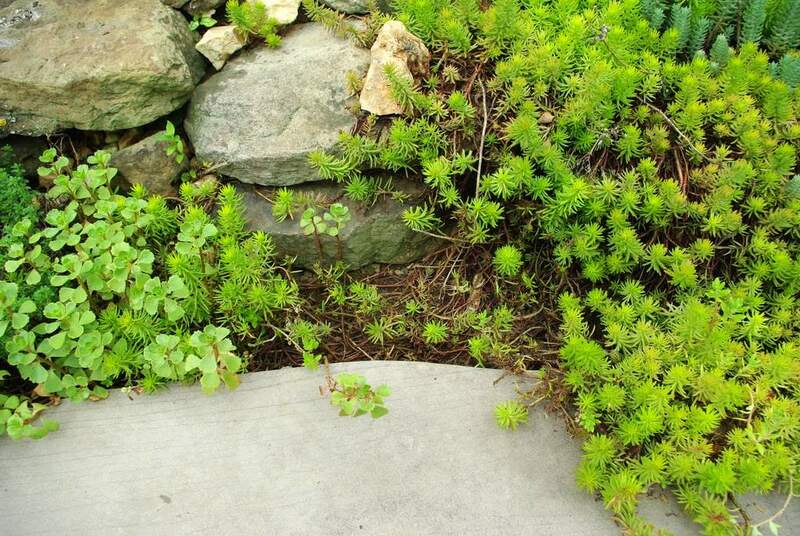 Do you have a more recent photo of the differences between the sedum and the thymes? 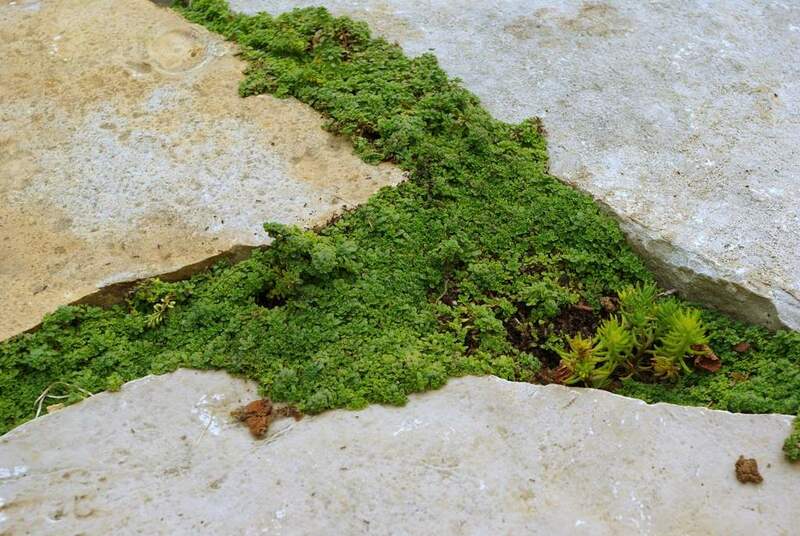 Please update us on your thyme and sedum in the flagstone. Very pretty! Gwen: What I've discovered is that although the patio gets lots of sunlight in the early part of the year, come mid-summer it's in full shade due to the overhead vines. 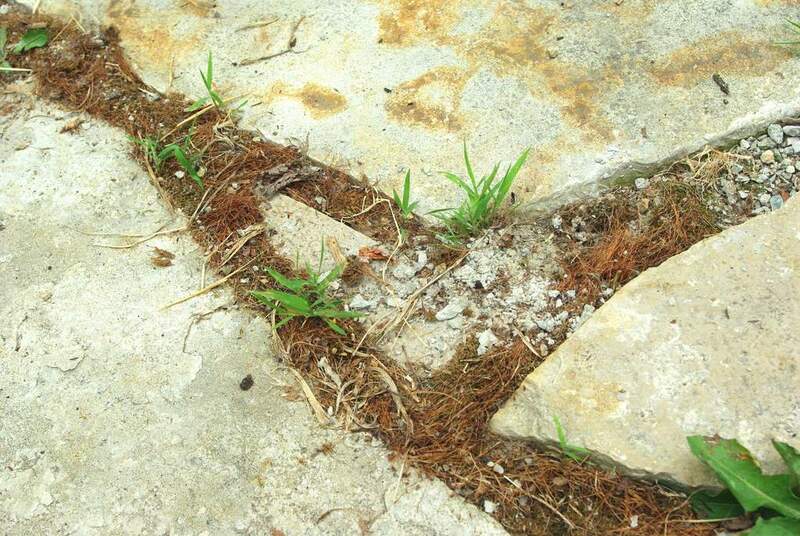 The end result is that *nothing* really grows in those cracks -- certainly not well enough to overpower the weeds. It's a constant battle for me. 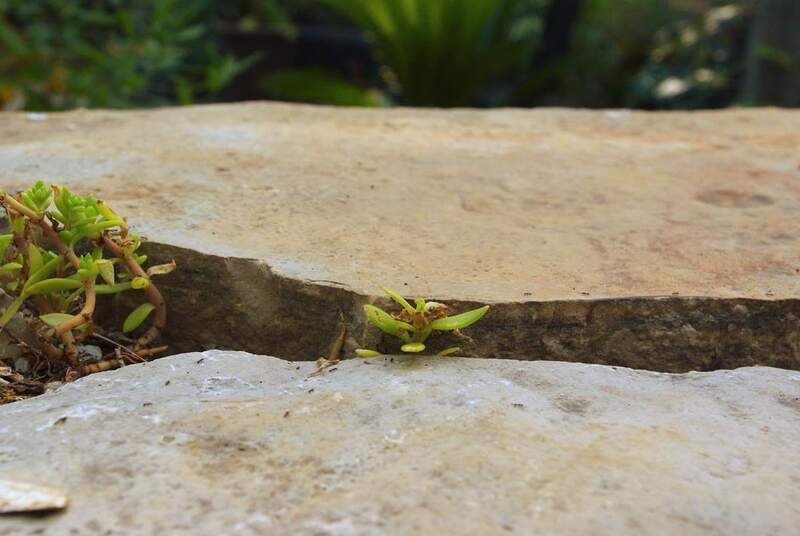 Those green plants in between those cracks actually look nice. 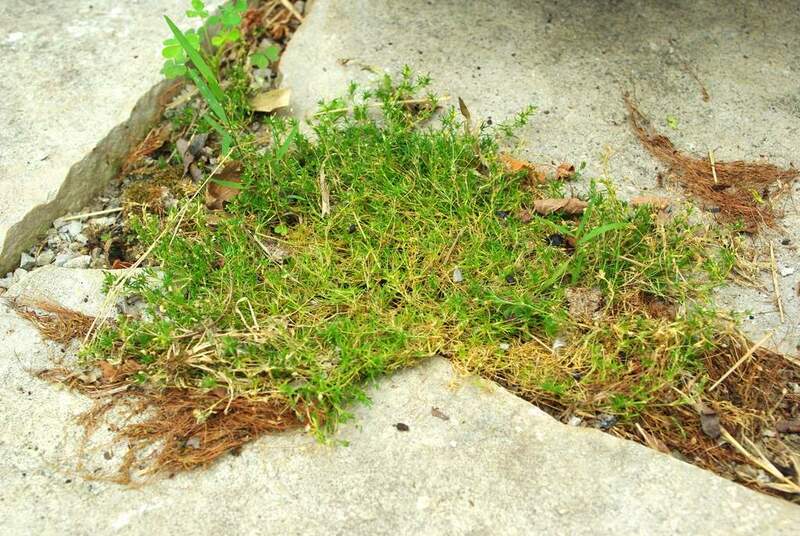 I think it's a great idea that they actually grow between those cracks. 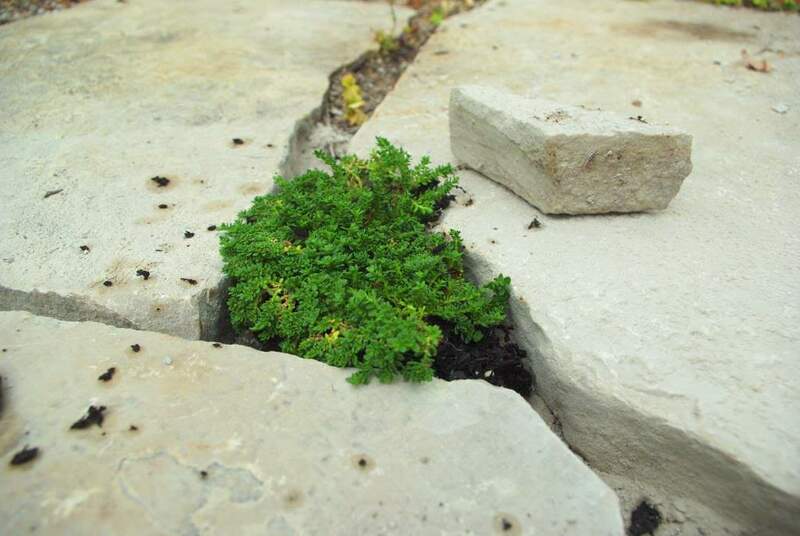 I think i want to do this for the cracks i found recently. It's better than covering them with something else. Hi -- looks like it's been a few years since your project began. 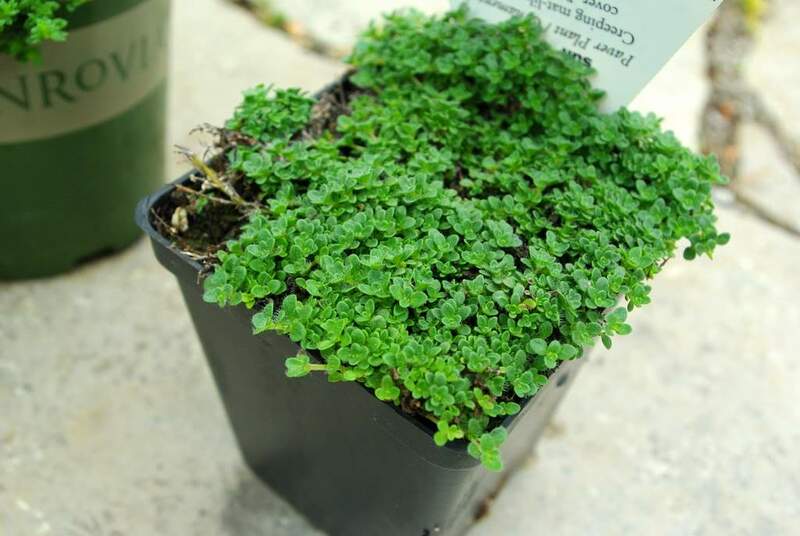 Any updates as to how the thyme worked over time? (ha).